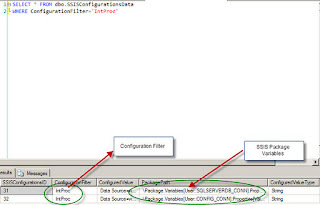 When working with SSIS packages, one of the aspects that need to be designed also is how to lyout the configuration for the Package. This relates to storing certain aspects of the packages like variable values, database connections, flat file/ftp connection information. 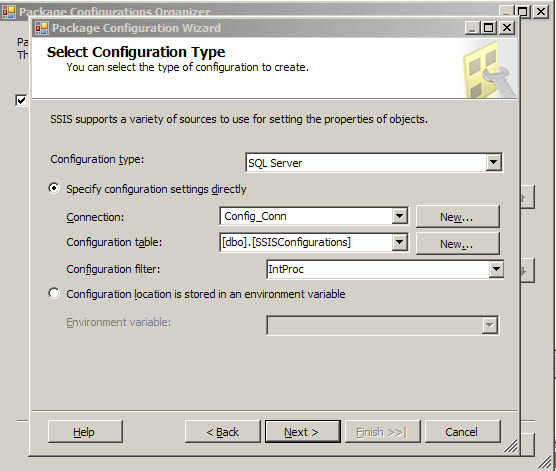 The are different ways to perform configurations, the one that is being talked about here is using SQL Server Configuration. First when one right clicks on the area of the package in the control flow task, the package configuration shows up, on choosing the user is presented with a wizard. 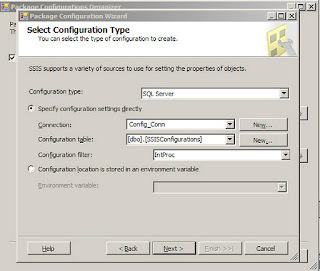 In the Package Configuration organizer window check the Enable package configurations and choose Add...In the Select Configuration Type Window Choose Configuration Type as SQL Server, in the Connection Drop down, the connection should point to the sql server database where the table SSISConfiguration data table is going to reside, next choose the SSIS configuration table, the next one is the configuration filter, this is the one which points to the different variable values, and database connection strings which are going to be used by the package. Here is an image of the Configuration window. Once the filter is chosen, click on the Next button and choose the properties of the variables that need to be stored in the SSIS Configurations table. 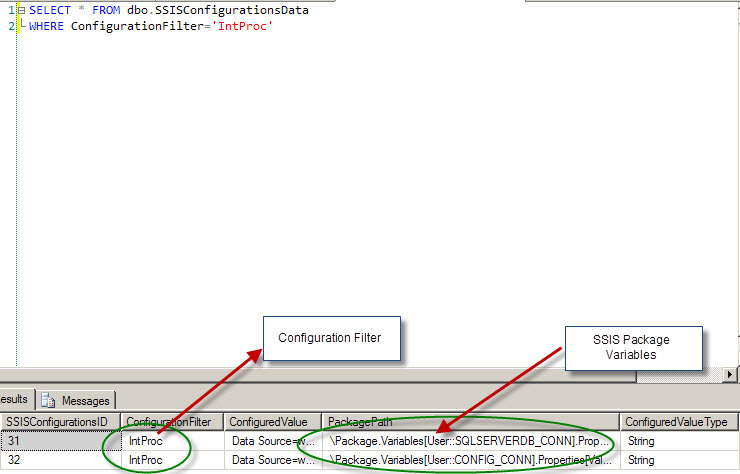 In this example, the Filter Intproc points to the following rows in the SSIS Configurations table. The PackagePath Column has the variable names in the SSIS package, whose values are being stored.